The Rivers are callings, the fish are rising. 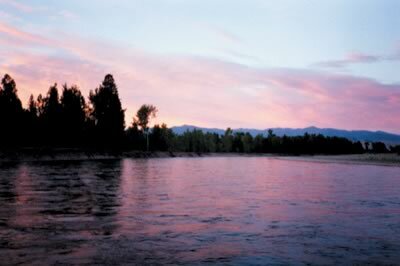 The Bitterroot’s journey begins in the mountain wilderness of southwest Montana, and ends when it joins the Clark Fork of the Columbia near Missoula. The Bitterroot offers 90 miles of floatable river, winding its way through one of the most beautiful valleys in the west. Cast to healthy populations of West Slope cutthroat, brown, and rainbow trout, in view of the rugged Bitterroot range to the west, and rolling Sapphire range to the east. Abundant hatches and mild climate makes the Bitterroot a truly unique trout stream. Dry fly fishing begins in March with the large Skwalla Stone Fly, and continues through-out the season, well into October, ending with midges and smaller mayflies. 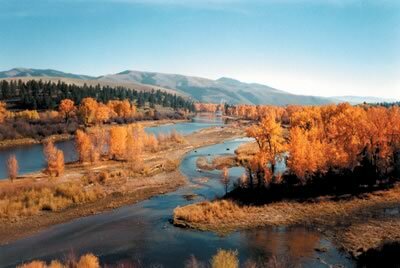 The Clark Fork of the Columbia is a large trout river by any standard. It gains water from Rock Creek, the Bitterroot and Blackfoot rivers near Missoula, before continuing on its journey to the Pacific. Like the river, the trout of the Clark Fork are large and challenging. You can cast to pods of rising rainbow trout with small dry flies. The proper fly presented naturally will be rewarded with fish over 17 inches with some topping 20 (that is if you can land them). The Clark Fork begins to fish well in July but our favorite time is fall when the water cools and mayflies’ hatches are plentiful. The Blackfoot has gained popularity thanks to Norman Maclean’s “A River Runs Through It.” The river has benefited from this popularity with projects that have improved habitat and increased numbers of fish. 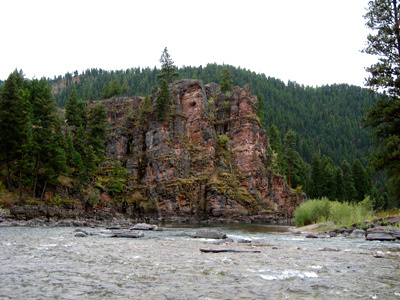 The river holds West Slope cutthroat, brown, rainbow, and the occasional rare bull trout. The Box Canyon stretch is a local favorite where you can fly-fish for trout while admiring the beautiful river canyon. The best times to fish the Blackfoot are in June when the large salmon and golden stone fly hatch brings the bigger trout to the surface, and again in fall as the number of floaters dwindle, leaving the river to us die-hard fly-fishermen (and women). The Missouri begins at the junction of three great trout rivers, the Gallatin, Jefferson, and Beaverhead near Three Forks, Montana. The stretch of river we focus our fly fishing operations is below Holter Dam near the towns of Wolf Creek and Craig. Like most tail waters the Missouri river is rich with aquatic life that produces large numbers of Brown and Rainbow trout. The Missouri has been called a giant spring creek and often fishes like one. Whether casting tiny dries to sipping risers, nymphing, or chucking streamers for trophy Browns, the Missouri has something to offer every fly fisher. Holter Dam is a three hour drive form the Missoula area and there are several options for overnight accommodations. 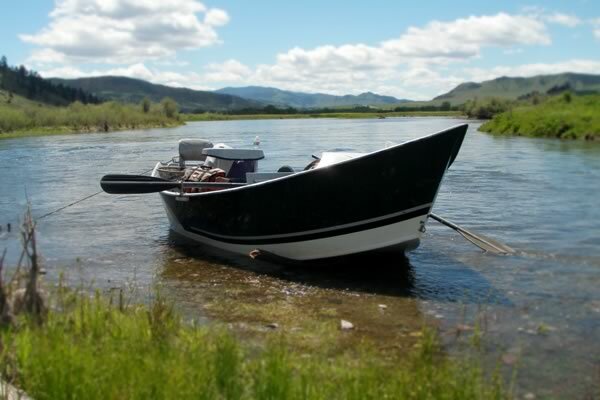 The Missouri is a great option in spring when the Bitterroot and other area rivers are blown out.